Harsh winds had raised Lake Ontario into a fury. Andrew Cisternino happened to be on watch that morning, in the tower of the Coast Guard station in Oswego. Typically, he would have joined the crew on the picket boat that was being sent to the lighthouse in the Oswego harbor. But nothing was typical about Dec. 4, 1942. Ginsburg and Cisternino, both from Syracuse, were close friends. The rubber boots were under a chair by Cisternino’s bunk. Ginsburg threw them on. He jumped onto a picket boat with eight others from the Coast Guard. A gale some called the “storm of the century” was blowing across the lake. Dark green waves smashed into a breakwall and collided with the lighthouse. Six men, including Ginsburg, died trying to defy that storm. They were attempting to rescue Karl Jackson, a Coast Guard lighthouse keeper, who’d been marooned in the lighthouse by the churning lake. The station commander, Lt. Alton Wilson, decided to send a powerful picket boat across the harbor. The storm had finally started to subside, and the lighthouse was only a few minutes away. After 74 years, he still contemplates everything that means. The crew made it to the lighthouse. A weary Jackson got on board. Two men took his place in the lighthouse, leaving eight from the Coast Guard on the picket boat, ready to return to shore. The storm was too much. The boat had barely left the lighthouse when the engine died. The churning water pulled the boat into the open lake, then threw it against the breakwall, slinging the crew into the lake. Two men—Fred Ruff and John Mixon—managed to claw their way to safety on the ice-covered wall. Ginsburg died in the lake. So did Wilson, the commanding officer; Jackson, the lighthouse keeper; and three others who served at the Coast Guard station: Leslie Holdsworth, Ralph Sprau and Eugene Sisson. At 95, Cisternino lives in quiet retirement in King Ferry, in Cayuga County. Last week, he wept when he spoke of the six men killed that day. He is among the last witnesses. He said their courage should never be forgotten. “They’re still in my mind,” Cisternino says. His own life, too, was put at risk. While Cisternino downplays the nature of his role, he was described as a hero in newspaper accounts of the disaster. 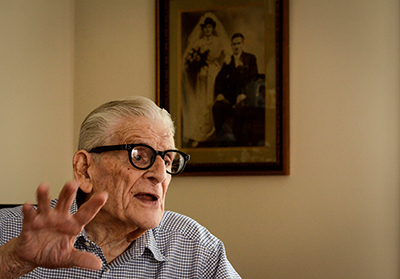 Cisternino, 95, talks about the long-ago incident about which he still thinks often. As soon as Coast Guard officers realized the picket boat had overturned, a second crew of rescuers was sent out from the station. They understood there was scant chance of finding survivors. Cisternino was on that boat, with a rope tied around his waist. He hoped to recover the bodies of his friends. They quickly spotted the body of Wilson, the station commander, caught in the violent lake. He “had a rain coat on and the air got under the rain coat and kept him afloat,” Cisternino says. He recalls Wilson as “a very respectful person, a very wonderful guy,” who had a kind of father-like demeanor at the station. Cisternino jumped into the freezing water and tried to retrieve his drowned commander. “I had my arm around him at one time,” says Cisternino, who was not wearing a wetsuit. His only protection against the bitter storm was a life jacket. The temperatures were frigid. His limbs began going numb. The waves tore Wilson’s body from his grasp. Cisternino, by that point, was in trouble. His friends pulled him to the boat, then had to lift him in. “Once I got in the picket boat, once the reaction set in, I got afraid,” Cisternino says. He was suffering from exposure. The Coast Guard rushed him to a hospital, where he stayed for a night. Back in Syracuse, when his family received a telegraph about Cisternino’s condition, his mother saw the deliveryman and “went berserk,” Cisternino says. She had heard about the tragedy. She thought her son, like his friends at the lighthouse, had been killed. 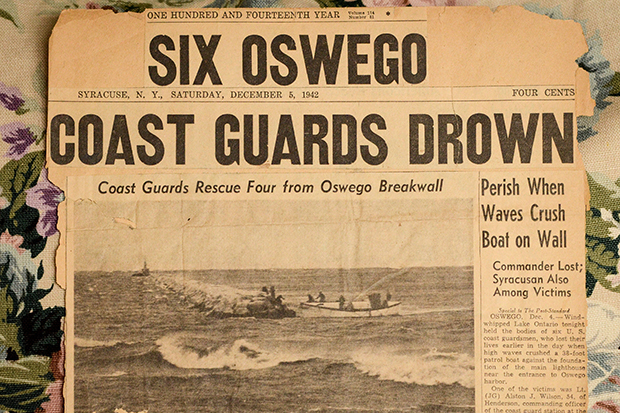 He didn’t remain at Oswego for long after the disaster. The nation was barely a year into World War II. Cisternino was sent to radio school. He spent much of the war in the North Atlantic and the Mediterranean, serving on Coast Guard vessels that escorted military convoys. They came under fire. He eventually made it home. It is never lost on him that everything good that happened in his long life might be gone if he had not been on watch in the tower. Cisternino attended the old Blodgett Vocational High School, in Syracuse. He met Julia “Judy” Jordan, a student at nearby St. Lucy’s High, at a high school party. They hit it off. They began dating. In 1943, they were married. Cisternino wore his Coast Guard uniform for the ceremony. After the war, he enrolled in Syracuse University. The young couple rented an attic flat and began raising their children. “Nobody (else) in my family went to college,” he says. He was part of the surge of veterans who arrived on campus in the late 1940s. His name is on the wall right now at Bird Library, where the University Archives has an exhibit called “Our Doors Opened Wide,” recalling the years following the war. To provide more space, the University erected many Quonset huts. The most striking was a vast dining hall at Comstock and West Colvin avenues. A contest was held on campus, to name the building. The exhibit mentions the winner: Cisternino. In those years, he and Judy did their best with little money. Cisternino made it through his undergraduate classes on the GI Bill, tending bar and doing odd jobs to help feed his family. Then he went straight on to earn a law degree. He figured, correctly, the degree was an investment. Cisternino became a counsel for Allstate Insurance. He worked for a time on Long Island, then returned to Central New York in retirement. Cisternino, father of five children, is now a great-grandfather. The greatest loss of his life occurred seven years ago, when Judy died after 66 years of marriage. In conversation, he is philosophical, usually upbeat. Still, his thoughts often return to the lighthouse. He and Ginsburg both grew up in Syracuse. They used to play catch with a football in Oswego, on autumn days outside the station. They were together until the morning when Ginsburg asked about the boots. At the station, the tragedy became a tale of such power that some claimed the lighthouse was haunted. Finally, in 1996, Coast Guard officials honored the six men killed on the picket boat. They invited Cisternino to the ceremony. Twenty years ago this month, the Coast Guard sent a boat to the lighthouse. Cisternino, who stood with Ginsburg’s father, threw a life preserver and some flowers in the water. Then as now, he reflected on how a lifetime can come down to utter chance, how one friend is ordered to stand watch while one gets on a boat. Eyewitness to lighthouse tragedy from Mike Roy on Vimeo.